Up until recently the Facebook share option had been using the FB Sharer code but FB announced that they have deprecated this code in preference of their new Share Dialog system, which requires a FB App ID. Don’t worry it’s an easy process which we will walk your through in this Guide. Where, why and how is it used? Do I need a review? How do I create an App? Do I need to have my App reviewed? Before you get started creating a Facebook App let me explain a bit about what it is and how it's used by CoalaWeb Social Links. The short answer is No. The long answer is that the CoalWeb Social Links extension uses a Facebook App to enhance the system but it isn't necessary for it to function correctly. Loading of the CoalaWeb Page module. The module will display correclty without an App ID. 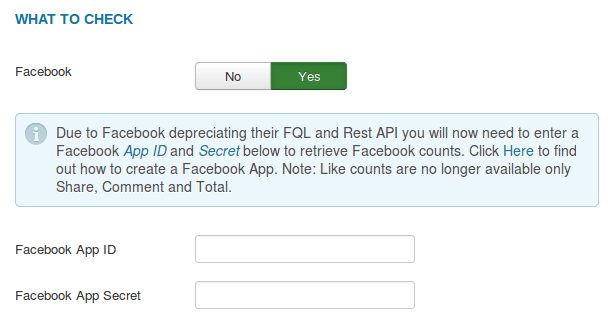 The App ID and App Secret can be used when retrieving the current Share, Comment and Total Facebook counts for a page. Version 1.0.0+ will work with out n App. Note: With the release of version 1.0.0 of CoalaWeb Social Links the count system will work without the use of an App. On large sites that make a lot of API requests I recommend setting a large locktime and potentially using an App to increase the API limit. 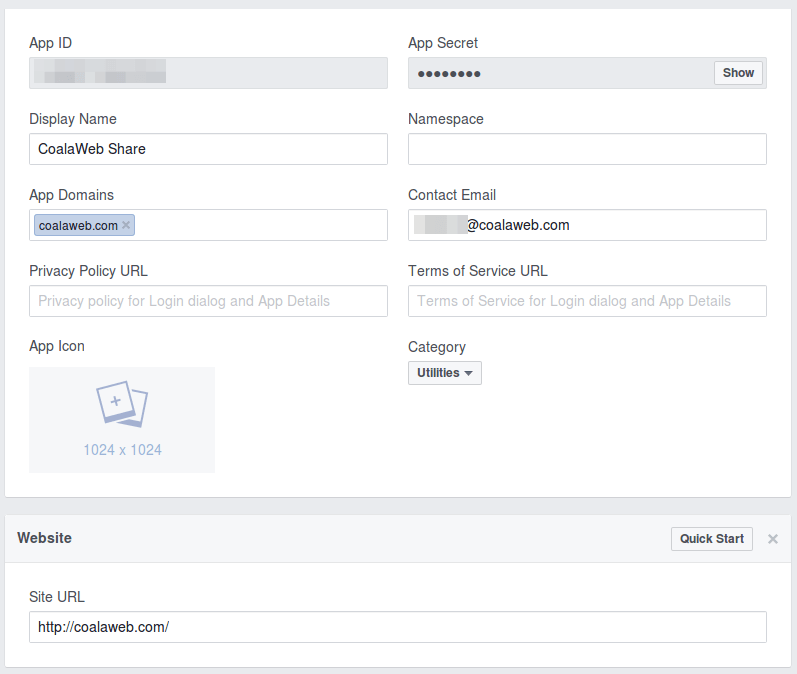 If you have decided you want to create a Facebook App and use it with the CoalaWeb Social Links extension read on. I have tried to maintain a step by step guide on how to create a Facebook App but due to the constant stream of changes Facebook keeps making to their interface I have decided it's best if users consult the guide provided by Facebook. Their guide will always contains the most up to date information. While working your way through their guide I recommend returning here to get tips and help with what settings to choose. To get start click Here and follow along with the guide consulting the tips below when needed. Note: If you are only using Facebook to manage pages, these instructions will not work you will need a personal Facebook account to continue. App Domains Enter your website domain i.e where the extension is installed leaving out the http. Terms of Service URL You must provide a Terms of Service URL. Site URL Enter your website domain i.e where the extension is installed including the http. Terms of Service URL - You must provide a Terms of Service URL. Use the top level domain in the App Domains and Site URL options then you can also use it for sub domains. In the column on the left click on Settings. Scroll down to the Security section. 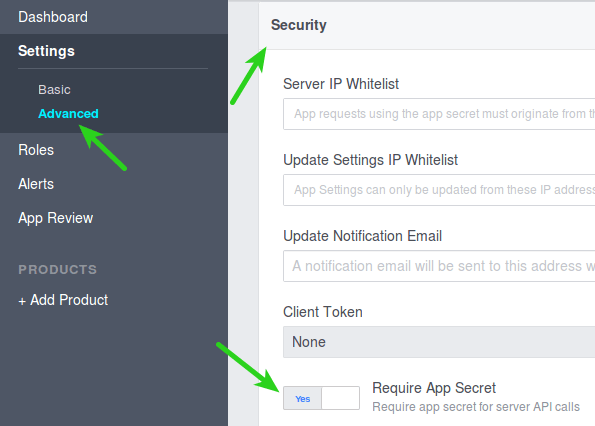 Find the toggle for App Secret Proof for Server API calls and click it to enable it. If your app uses advanced FB Login or Messenger permissions, or if you want your app to be listed in App Center, you need to submit the app for review. Note: Based on my research Apps should continue to function for the purposes of the CoalaWeb Social Links extension after the 1st of August even with no review but I will continue to monitor the situation. You may visit our website without providing personal details. Your personal details will only be collected if you freely disclose them during your visit to our website. Our website contains programmes (plug-ins) operated by the social network Facebook. These programmes are exclusively operated by Facebook Inc., 1601 S. California Ave, Palo Alto, CA 94304 USA (Facebook). The plug-ins are clearly visible on our website through the use of the Facebook logo or through the add-on “like” and or "Share" buttons. When visiting our website containing such a plug-in, your browser will establish a direct link with the servers operated by Facebook; as a result the content of the plug-in will be transferred to your browser and embedded in the website being shown. If you visit our website whilst signed into your Facebook user account, information concerning your visit will be transferred to Facebook. Facebook can assign your visit to our website and to your user account. 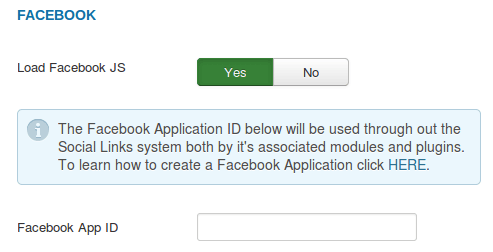 Information arising from interaction with a Facebook plug-in (such as by clicking a Facebook “like” button) will be directly transferred to and stored by Facebook. To prevent this you must log out of your Facebook account before visiting our website. We will be glad to help you with any general or technical questions. Copyright © 2019 CoalaWeb. All Rights Reserved. CoalaWeb.com is not affiliated with or endorsed by the Joomla Project or Open Source Matters.